Cedar Creek is located northeast of Springfield in Lane County, Oregon and flows into the McKenzie River. While home to sensitive species, including spring Chinook, native trout, Western pond turtles and American beaver, the water quality of the basin has been negatively impacted by farming and gravel extraction. Agriculture can disturb soil and often requires fertilizers or pesticides. When it rains, runoff carries nutrients and soil off the land and into nearby waterways. An overabundance of nutrients promotes excessive plant and algae growth, reducing water quality and harming native species. Excess sediment can decrease water clarity and fill in the streambed substrate that salmon use to build their redds. One way to mitigate these impacts is to plant a buffer of native vegetation along the waterway to reduce and filter runoff. Before restoration, the riparian areas of the Cedar Creek site were dominated by invasive Himalayan blackberry and reed canary grass that were crowding out the native species. 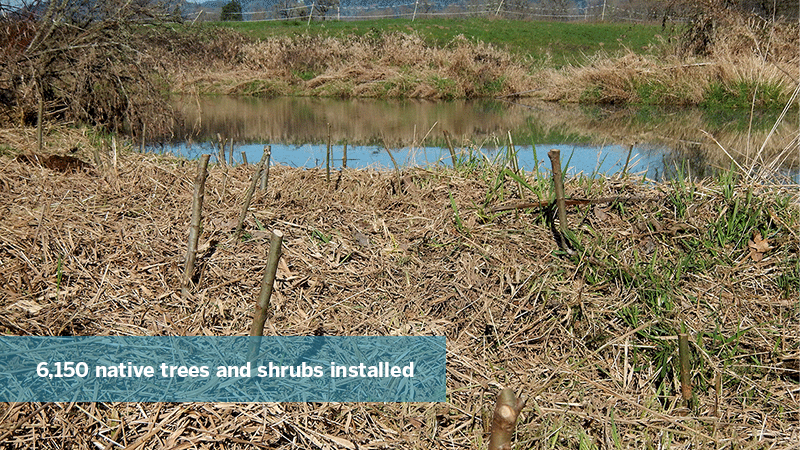 In 2015, The Freshwater Trust and McKenzie Watershed Alliance installed 6,150 native trees and shrubs along approximately half a mile of Cedar Creek. 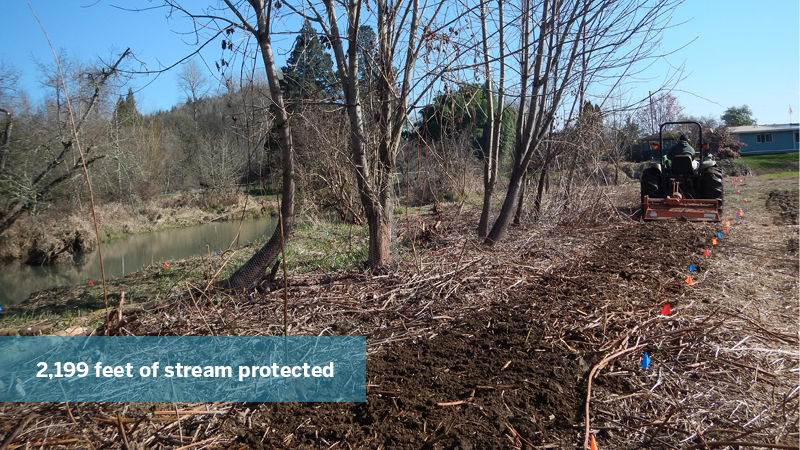 The project shades the stream while providing an important buffer from the adjacent agricultural uses and improves habitat. We used the Nutrient Tracking Tool (NTT) to quantify the reduction in nitrogen, phosphorus and sediment from a conservation action like planting trees. To estimate the water quality benefits from the plantings, we combined management information from the landowner, including current agricultural practices at the site, type of crops, tillage practices and irrigation practices, with other datasets, such as soils, local climate data and remote sensing elevation data. 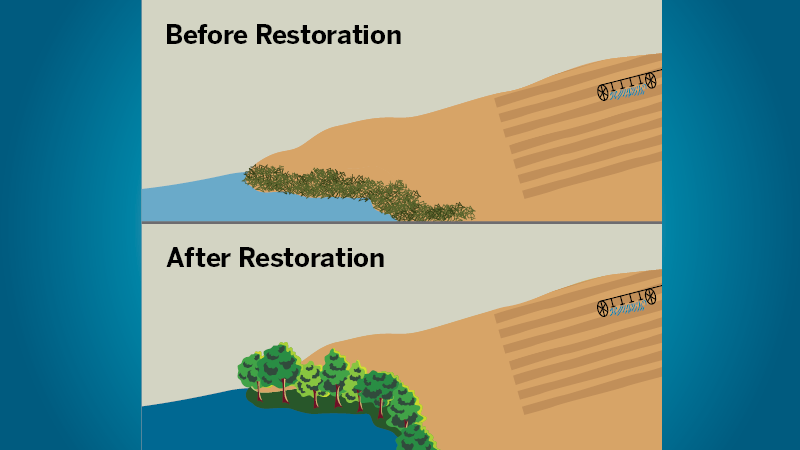 This methodical approach is referred to as Quantified Conservation: the method of using data and technology to ensure that every restoration action translates to a positive outcome for the environment. NTT models the change in nutrients and sediment by comparing a pre-project scenario featuring the invasive vegetation to a modeled post-project condition with a native forest buffer. The difference between these scenarios represents the reduction in nitrogen, phosphorus and sediment in pounds per year. We also calculated the reduction in solar loading as a result of increased shade from taller native trees, such as cottonwoods. Once the trees mature, solar loading will be reduced by approximately 13 million kcals/day in July and August. Cooler water has more oxygen and protects the incubation of eggs, increasing survival rates of native fish. These results can be viewed using our interactive Uplift Tool.